MK23 asks: How do they figure out the maximum occupancy for a building? 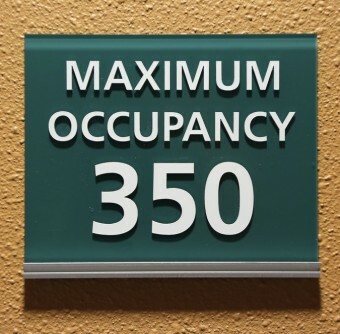 Generally speaking, the maximum occupancy of a room or building is primarily determined by the available exits, with each exit accommodating only a certain number of people before bottlenecking occurs. The other key component in determining the max occupancy of a building or room is the intended use of the space, whether it’s, for instance, a restaurant with tables and chairs or a more open event space. In the United States, the National Fire Prevention Association (NFPA) also forbids an exit from leading occupants through a kitchen or storage room on their way out of the building. In order to determine the maximum number of people who are able to safely be in a room or building, the IBC recommends a certain number of inches of doorway per occupant. Exits that consist of a stairway need to have 0.3 inches of doorway per person, and all other exits need 0.2 inches of doorway per person. So a function hall that has a maximum occupancy of 1,000 people and an exit that consisted of a corridor without stairs will need 200 inches of doorway. With doorways at around 36 inches in width—wider than the Americans with Disabilities Act requires in the United States—that function hall would need approximately six such doors. As mentioned, another important consideration for determining the occupancy of a space is the intended use of the space. A restaurant with chairs and tables will have a smaller maximum occupancy than a bar with an open dance floor or layout. The IBC recommends for spaces with unconcentrated use of chairs and tables, such as a restaurant, that 15 square feet on that floor of the building be dedicated to each occupant. 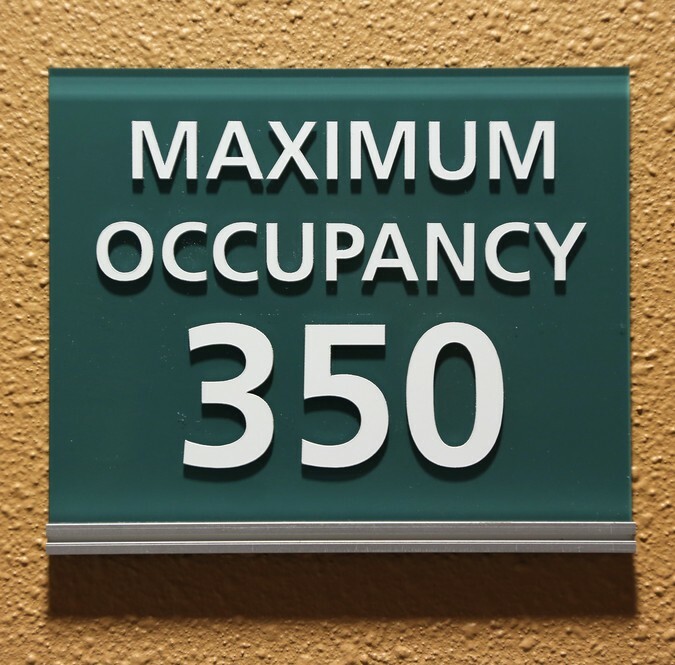 That means a 500 square foot restaurant might have a maximum occupancy of 33 people. However the IBC recommends areas with concentrated use of chairs, such as a bar with a dance floor, have 7 square feet of floor space on that floor of the building per person. The same 500 square foot space in a bar with a dance floor would have a tentative maximum occupancy of 71 people. That said, those numbers are all dependent on whether or not enough exits exist to allow all of those occupants to safely leave the building during an emergency. The impetus for these regulations in the United States dates back to the worst hotel fire in the country’s history. The Winecoff Hotel Fire occurred in the early hours of the morning on December 7, 1946 in Atlanta, Georgia. The 15-story hotel considered “fireproof” due to its brick exterior had a single staircase that allowed guests to move from the upper floors to the first floor. That staircase had turned into a chimney for the smoke and fire by the time that the first of the fire fighters arrived at 3:45 AM. A number of trapped guests tried to escape through their windows, but only a small portion trapped managed to survive their escape while the rest either died inside or fell to their deaths. The fire resulted in 119 fatalities which amounted to 41 percent of the hotel’s guests that night. Of the remaining, 65 were injured and the rest made it to safety whether because they were below the third floor fire level or were rescued by the 385 fire fighters who ultimately responded to the fire. This fire occurred just six months after the La Salle Hotel fire which killed 61 people. After these fires, President Truman ordered a national conference on fire prevention to revise fire codes for buildings. One of the deadliest nightclub fires in U.S. History took place at the ‘Cocoanut Grove’ in Boston, killing 492 people. (Legally the club was only authorized to have a maximum of 460 people in it.) There was only one other such event fire, at Chicago’s ‘Iroquois Theater’ in 1903, that had a higher death toll- 602 people. Like the Winecoff Hotel Fire, the Cocoanut Grove nightclub fire brought about some major changes in safety standards and building codes. Most notably, all exterior doors to commercial buildings had to open outwards. This was not the case at the Cocoanut Grove club, and when the fire started the crowd of people rushed to the doors to get out. The surge of people pushing against the doors prevented the inward opening doors from opening, trapping those inside. The Station Nightclub Fire, one of the most recent deadly nightclub fires, holds the rank of 4th deadliest nightclub fire in the U.S. after 100 people died in the 2003 blaze caused by pyrotechnics. The Americans with Disabilities Act requires single doors to be 32 inches wide and double doors to be 48 inches wide. International Building Code 2009. Country Club Hills, Ill.: International Code Council, 2009. NFPA 1: Fire Code. 2012 ed. Quincy, Mass. : National Fire Protection Association, 2011. I often wonder at the number of public establishments where one half of a double door is locked. When calculating maximum capacity does the width of doorways include those that are locked? I suspect such locked doors ARE included in making the calculation and put the proprietors in violation of the law when these doors remain locked. For that matter, why have the door at all if it’s going to be locked? Do they remain locked because of the few seconds it saves someone to unlock them? I do not think that has anything to do with the question. Whether a certain lock is permitted or not is irrelevant. The question is if the second door leaf can remain in a locked (fixed position) during business hours. The answer is NO. It is a violation to have a designated exit locked from the inside during operating hours. The only exception is correctional facilities, hospital wards, etc. Most businesses use “panic” hardware on double and single leaf doors to avoid violating the law. This allows the door to stay locked on the outside from unwanted guests, yet visitors to escape easily from the inside. Having to manually turn the “locked dead bolt” during normal operating hours or emergency is considered a violation. The double doors are designed to allow workers to bring in large furnishings. To meet fire codes, a single door of the appropriate dimensions and meeting other requirements is usually sufficient. When determining maximum occupancy of a restaurant, is the amount of square footage of the whole building used or is it the amount of square footage where the tables and chairs are located. E. G. Sq footage of building is 10000 sq ft of which 4000 sf ft consists of offices, kitchen, hallways, entrance and exit halls, storage and restrooms; thus leaving 6000 sq ft of space where tables and chairs, and booths are located. If we use the latter figure (6000 in this example) and the standard of 15 sq ft per person, the max occupancy is 400. But if we use the whole bldg sq footage (10000 in this example) then the max occupancy is 667. So which is the correct way to determine the max occupancy in a restaurant? Interesting that dance floors affect the calculations wondering if pool tables shouldn’t also be considered. They certainly occupy a good deal of space. Does the number of staff figure into the occupancy figure or is it just for the seating area? I think the original poster was referring to the practice by 7-11s and some other establishments, to lock the right hand door, in conjunction with placing a measuring tape on the door posts, and a video camera recording the whole thing. The purpose of that is to catch a robber — making him bounce and pause for the video camera to get a good image, before fleeing out the other door. Since these doors are typically 36″-locked and 36″-unlocked, 36″ of door will handle more than 200 people; I don’t think that constitutes a violation of fire code. The ADA # of 32″ is correct but you are missing a key fact…the 32″ is clear opening width. A 36″ doorway…which you claim is larger than required… is larger but only by 3/4″. A standard door frame has a soffit…the part the door rests or stops against of 5/8″ that must be taken away from the 36″. The 1 3/4″ door in an open position of 90 deg. (calculation for ADA clear width) using standard hinges projects 2 5/8″ into the clear opening. 2 5/8″ + 5/8″= 3 1/4″.. subtract that from 36″ and the clear width is 32 3/4″. NFPA does not use clear width in determining egress capacity.